Social media and lawsuits don’t mix. This is common sense, people. If you are injured and pursuing a claim, but you post about how tired you are from your martial arts tournament…this is going to be a problem! If you are fighting for custody of your kids and you post pictures of yourself drunk every weekend…this is going to be a problem for you. If you are facing criminal charges and you admit to the crime and make jokes about it on your Facebook status…this is going to be a problem for you! 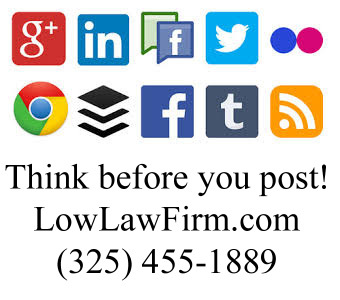 Criminal charges, social media and lawsuits, think before you post! Never underestimate your opponent! If you think that the individual(s) opposite you will not think to look at your social media…you are WRONG! It may not be the first place that is looked at, but it WILL be looked at. I will give you an example…each time I file a lawsuit, I get what is called an “Answer” from the opposing party, usually an attorney. This provides me with the name and contact info for the attorney. The first thing I do is go online and do my recon! And I know they are doing the same thing! They look into me and I look into them. But at some point we are all going to be looking into the clients. Am I involved in a lawsuit? Or have I been charged with a crime? If the opposing lawyer sees this can he/she twist it into something it is not? Will I regret posting this if I have to answer questions about it later in a deposition, trial, or in front of a judge or jury?